Looking back at the CQ WW WPX CW contest of 2017, I was even surprised myself. As a milliwatt enthusiast, I often use very low power. I don't use a fixed power, but reduce my power according the S-meter reading. I reduce my power, when the signals get stronger. The best band was the 20 meter band. Please look at the interesting tables below. It is my pleasure to show the two tables. At the start of the contest from QSO number 2 to 13, I could use a power of 800 mW or 360 mW to make QSO's. In the first QSO I was too eager to use 80 mW, so the QSO was not completed. Even a QSO that is made with 800 mW can be more than 1000 Miles per Watt QSO, when the distance is more than 800 miles. In QSO 2 to 11 is the distance more than 800 miles. 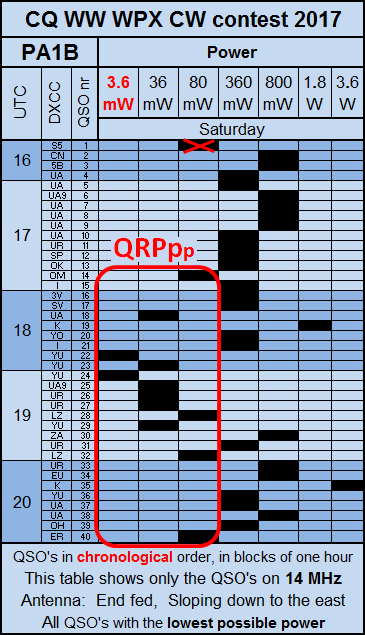 It is interesting to see that from QSO 18 to 29 the conditions went up. So I could use 36 mW, using the 10 dB section of the PA1B 40 dB Step Attenuator (Click to visit). QSO 19 is also good for 1000 MPW. Then the conditions went up further. In QSO 22 and 24 I met two stations from YU with an ear splitting signal, so I reduced to 3.6 milliwatt before answering their CQ. My FT-817 gives 360 mW on the lowest power setting. With the 20 dB attenuator section switched on, 3.6 milliwatt goes to the antenna. Hi. 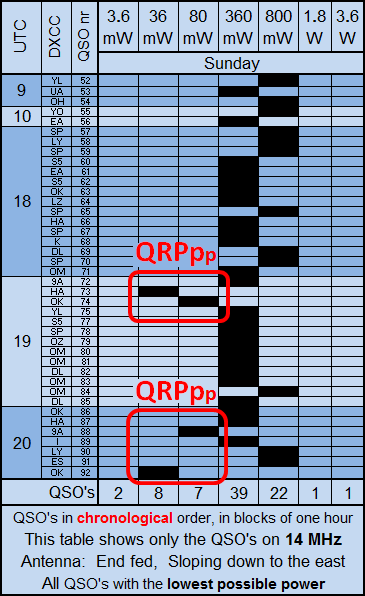 QRPpp is the (not official) term that I use for a power of less than 100 mW. hi. After 40 QSO's, all on 20 meters, I went to 40 meter. These QSO's are not in the tables. The next table show the QSO's that I made on Sunday on 20 meters. On Sunday I made most QSO's with 360 mW or 800 mW. Both tables show that after 18:00 UTC the conditions go up and QSO's with 36 milliwatt are possible. I could make 4 QSO's with 80 mW and 36 mW. On Sunday I could not make QSO's with less than 36 mW, because I had worked all of the very loud stations before, on Saturday.